To Cite: Sepahvand E , Baghernezhad A, Adeli M. Comparison of the Glasgow Coma Scale with Full Outline of Unresponsiveness in Predicting In-Hospital Mortality of Patients with Cerebrovascular Accident in Intensive Care Units, Crit Care Nurs J. 2018 ; 11(3):e84981. doi: 10.5812/ccn.84981. Background: Full Outline of Unresponsiveness (FOUR) scale is a strong predictor of hospital patients’ mortality, survival rate, and prognosis. Objectives: The aim of this study was to compare FOUR and GCS scores in predicting in-hospital mortality in cerebrovascular accident (CVA) patients admitted to intensive care units. Methods: A total of 197 CVA patients were enrolled in this prospective study. Each patient was evaluated with FOUR and GCS. The area under the ROC curve was determined for in-hospital mortality outcomes. Results: The mean age of the patients was 71.00 ± 12.68 years, and 64% were male and 36% were female. The sensitivity of FOUR and GCS was 94.12% and 90.59% respectively. The area under the ROC curve was 0.841 for FOUR scale and 0.815 for GCS. Conclusions: The results of our study showed that FOUR scale is a functional tool for evaluating and predicting in-hospital mortality in CVA patients, and it enjoys high sensitivity and specificity. However, further studies are warranted. Cerebrovascular accident (CVA) is a syndrome characterized by severe onset of neurologic impairment for more than 24 hours; it is the result of a local damage at the central nervous system caused by impairment in cerebral blood flow. Annually, about 750,000 cases of CVA occur in the United States and about 150,000 patients die of this condition (1). As predicted by the World Health Organization (WHO), CVA will be the second cause of mortality (ranked after cardiovascular diseases) in both developing and developed countries by 2020 (2). According to WHO, Iran is located in a region with a moderate prevalence of CVA, and about 100 to 300 cases of CVA per every 100 thousand people are expected in the country (3). The neurological status of patients with cerebrovascular disorders may be normal or abnormal (1). CVA affects the cerebral structures controlling the level of consciousness. There are various instruments for the assessment of the level of consciousness in CVA patients, among which we may note National Institutes of Health Stroke Scale (NIHSS) and Glasgow Coma Scale (GCS) (4). NIHSS is one of the scales used for the assessment of the level of consciousness; however, among its items, only one is intended to check the level of consciousness; therefore, it cannot be used to conduct a concise survey of the neurological status (5). Among different scales used for the assessment of the level of consciousness, GCS is the most widely used scale, which uses the three items of verbal, motor, and eye response to evaluate patients’ level consciousness (6). However, like other developed instruments, this scale has some shortcomings among which we may note the following: (1) Verbal response item always has the lowest score in patients with endotracheal tube even when the patient is conscious; because of the intubation, the patient is not able to respond and therefore, the total GCS score is underestimated; (2) to accurately assess the level of consciousness, it is necessary to check brain stem reflexes, medulla oblongata performance, and respiratory function of the patient. However, the GCS does not address such clinical indicators (7, 8); and (3) GCS does not examine minor changes in the level of consciousness of comatose patients in intensive care unit (ICU) (9). In addition, eye response in GCS is a less reliable criterion to predict the prognosis and outcome of a condition in patients (10). A recent study presented a weak relationship between patients’ GCS scores and their prognosis (11). Given these shortcomings, researchers have made some efforts to develop an instrument that can resolve the defects of GCS and make an accurate assessment of the patient. Full Outline of Unresponsiveness (FOUR) scale is a new instrument that was developed to handle the limitations of GCS; it can be used by physicians, nurses, and other health care team members and can be effectively used in ICU (12). This scale has four items including eye response, motor response, brain stem reflexes, and respiratory status, and its scores range from 0 to 16. Each item is scored from 0 to 4, as a result the personnel can be more easily trained about and remember its method of use (13). FOUR scale is a strong predictor of hospital mortality, survival rate, and prognosis (14). Moreover, this instrument is capable of evaluating brain stem reflexes and respiratory status and detecting disorders such as locked-in syndrome and vegetative state. Idrovo Freire evaluated the reliability and validity of this scale and according to the results, FOUR scale has a good to excellent internal validity. FOUR scale, as a diagnostic scale used for determining the level of consciousness, has a high degree of operational reliability and a high level of accuracy (15). Sepahvand et al. conducted a study in 2015 to compare the accuracy of FOUR and GCS in predicting mortality in patients with traumatic brain injuries hospitalized in ICUs; the results showed that the FOUR scale was more efficient in predicting mortality and could be considered as a good alternative for GCS (16). In a study conducted abroad, Bruno et al. reported that the FOUR scale had a good predictive power with high levels of sensitivity and specificity to assess the neurological status of CVA patients (17). Regular and accurate assessment of patients and being aware of small changes in their neurological status play a major role in the proper diagnosis of patients and are necessary for adopting subsequent actions in this area. Appropriate evaluation of patients helps to direct the relationship between the treatment team; this sustained and purposeful relationship eventually helps to achieve optimal patient outcomes. FOUR score has been evaluated in patients with altered consciousness in two former studies (16, 17). However, more data is still required on the use of FOUR score in patients, especially those with non-traumatic coma. Because of the weaknesses of the GCS and its failure in assessing verbal responses in intubated patients and the strengths of the FOUR scale in brainstem reflex assessment and because of the significance of accurate assessment of the level of consciousness in patients admitted to ICUSs. We aimed to conduct a comparative analysis of FOUR and GCS and evaluate their efficiency in the prognosis of CVA patients to evaluate the validity of these scales in teaching hospitals in Khoramabad city, Iran, 2015. In this prospective study, the two scales of GCS and FOUR were evaluated and compared in terms of their ability in predicting in-hospital mortality in patients with non-traumatic CVA (hemorrhagic and non-hemorrhagic stroke); it was conducted on patients admitted to ICUs of teaching hospitals in Khoramabad city. In this study, we used the convenience sampling method and a total of 196 patients were entered into the study. The inclusion criteria were as follows: Being older than 18 years, surviving 24 hours after admission to ICU, not receiving sedatives and neuromuscular blockers, not having history of any neuromuscular diseases, not having family history of hereditary neuromuscular diseases, and being hospitalized for at least four weeks (16). If the patient received a muscle relaxant during the time of admission or was taken out of ICU before a month, s/he would be excluded. The required data were collected through daily visits and evaluation of the patients utilizing both GCS and FOUR. The study protocol did not interfere with the routine care and treatment of the patients and was approved by the Ethics Committee of Lorestan University of Medical Sciences. The subjects were investigated using the gold standard and the two scales of FOUR and GCS. In this study, the gold standard was direct observation of the patients by the researchers. Using the two scales, the patients were investigated in the second 24 hours after hospitalization, as well as one week, two weeks, three weeks, and four weeks after hospitalization; the scores of each scale obtained by the patients were recorded. In order to avoid bias, the patients were classified into two groups of A and B; the first person in group A was first investigated using the FOUR scale and the second person was first investigated using the GCS. The patients were studied over a month. The cutoff points for the GCS and FOUR scales were 5 and 6, respectively. A FOUR score of 6 or less and a GCS score of 5 or less was considered as an expected risk of death (14). Up to a month after hospitalization, the patients were followed up to assess survival or mortality (16). If the patient was discharged, one month after discharge, s/he would be followed up for death or survival. The collected data were analyzed using SPSS version 18. Data analysis was performed using descriptive statistics (i.e., mean, standard deviation, frequency percentage). To determine the relationship between dependent and independent variables, we used Chi-square test for both methods (for related confidence intervals). We also used Pearson or Spearman correlation coefficient (when needed) and calculated the odds ratio. Furthermore, we plotted ROC curve and compared the area under the curve (AUC). The significance level was set at 0.05. This study was conducted among 196 patients with the mean age of 71.00 ± 12.68 years (age range: 30 to 94 years). Overall, 64% of the patients were male and 36% were female. Of the 196 CVA patients, 43.1% of the patients survived after evaluation and 56.9% died (Figure 1). 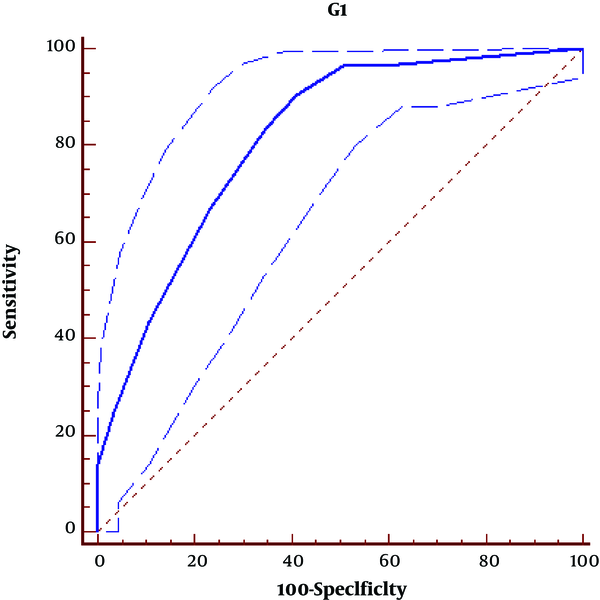 The sensitivity of the FOUR and GCS scales was 94.12% and 90.59%, respectively (Table 1). t-test showed a significant difference between patients’ survival and death in the FOUR scale (P < 0.0001), but the difference in GCS scale was insignificant (P = 0.574). The area under the ROC curve was 0.841 for the FOUR scale and 0.815 for the GCS (P = 0.0001; Figures 2 and 3). At the cutoff points of 6 and 5, respectively, the two scales of FOUR and GCS had the highest level of sensitivity, specificity, and predictive power. Abbreviation: FOUR, Full Outline of Unresponsiveness. The survival rate of CVA patients is 96% in those who do not have loss of consciousness, while it is below 30% in patients without consciousness (15). The results of our study showed that the FOUR scale, with a high sensitive and specificity, is a good alternative for other scales used to assess the level of consciousness in CVA patients. When using this scale, the area under the curve is large; in addition, it can be used to assess other factors such as brain stem reflexes and respiratory status. Hence, this scale provides a high level of accuracy when assessing the neurological status of patients. In another study conducted by the same author, the two scales of FOUR and GCS were evaluated in patients with traumatic brain events, the results of which showed that the FOUR scale can be a good alternative for GCS and can be used for the prognosis of patients (16). In a study by Kasprowicz et al., the FOUR scale was used for investigating traumatic brain injury patients admitted to ICUs. The results of the mentioned study showed that the FOUR scale was as effective as the GCS in evaluating patients (13). Moreover, in a study by Sacco and Carolei, the FOUR scale was introduced as a valid and reliable instrument to evaluate comatose and CVA patients (5). Studies conducted in emergency departments to evaluate quick and easy application of the FOUR scale are of great value. In a study by Stead that was conducted in emergency wards on patients with impaired consciousness, 22% of patients were affected by CVA; according to the results, there was no significant difference between the FOUR and GCS in terms of effectiveness (18). Kocak et al. evaluated the efficacy and usefulness of the FOUR scale in patients with acute CVA admitted to ICUs; the results showed no significant difference between the FOUR and GCS in terms of patient prognosis, and the two scales were equally effective (19). It is necessary to conduct further studies to evaluate the similarities between the two scales of FOUR and GCS in terms of sensitivity and specificity and the evaluated factors, especially in patients with CVA, to make a better judgment. The area under the curve in our study for both FOUR and GCS which is in line with the results of a previous study (P = 0.0001) (16). In Kocak et al.’s study, the results of ROC curve analysis showed that both FOUR and GCS were effective in the prognosis of patients’ survival and mortality (19). In Mansour et al.’s study, patients with CVA were assessed using the FOUR and GCS; according to their results, there was no significant difference between the area under the curve of FOUR (0.90) and GCS (0.93) (20). Bruno et al. showed that the area under the curve for the prognosis of comatose patients who were hospitalized in ICU was 0.70 (17). In Baratloo et al.’s study, the area under the curve for both FOUR and GCS was 0.95 (21), which is inconsistent with the results of our study and other studies. The observed differences could be attributed to the fact that previous studies evaluated patients with ischemic and hemorrhagic CVA and they were not studied separately. However, the pattern of changes in consciousness of these two groups of patients might be different. The difference observed in Baratloo et al.’s study could be due to differences in the type of patients surveyed. In our study, the best cutoff point for the FOUR scale was 6, while in Wijdicks et al.’s study the cutoff point of the FOUR scale was 9 for hospital mortality (11, 22). In our previous study, which evaluated patients with traumatic brain injuries, the best cutoff point was 6 to 7 (16). In Akavipat et al.’s study, a cutoff point of 10 provided the best sensitivity and specificity for the FOUR scale (23). This difference in results may be due to differences in patients’ conditions, type of patients with an impaired level of consciousness, and environmental factors surrounding the hospitalized patients. Although the GCS is used in many centers and hospitals to predict the outcome and severity of injuries, it is inefficient in the assessment of intubated patients; this limitation can be resolved via using the FOUR scale. In the present study, likelihood ratio was higher in the FOUR scale than in the GCS, which indicates the greater ability of this scale in better identifying patient outcomes, but further assessments are needed. Our study had several limitations. We did not explore the role of this score to detect and communicate serial changes in comatose patients. Since this study only reflected admission ratings and outcomes, it may not truly reflect the predictive ability of the scores. Researchers have shown that changes in scores have a predictive value in comatose individuals and comparing serial changes in the several scores may provide a better understanding of the predictive ability of the scores. 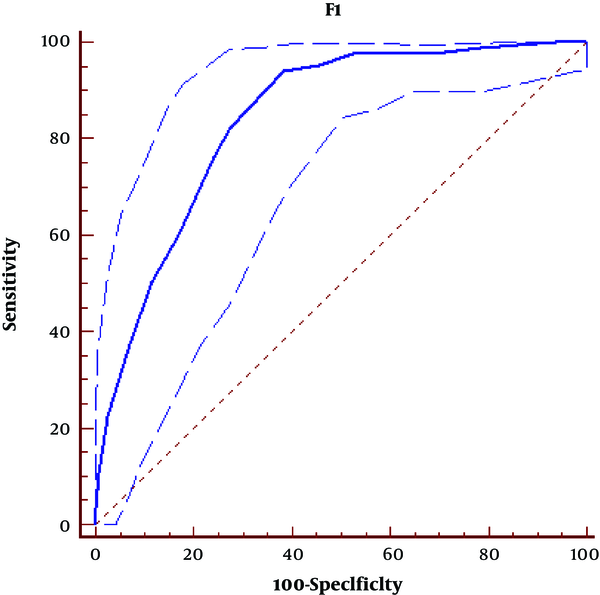 The results of our study showed that the FOUR scale is a functional tool for evaluating and predicting in-hospital mortality in patients with CVA and has high sensitivity and specificity. The scale which evaluates brain stem reflexes and respiratory status makes it possible to perform a correct and accurate assessment of comatose patients. It is able to determine minor changes in the neurological status of patients. In our study, the best cutoff point for the FOUR scale was 6, and it had the highest level of sensitivity and specificity. However, further studies are needed to determine a more precise and standard cutoff point. Because of the shortcomings of the GCS in assessing patients, it is necessary to develop a more precise and functional scale to be used by physicians and nurses. The FOUR scale has some features that make it a good alternative for GCS and thus, it can be effective in the treatment of patients. We would like to thank all the personnel in the ICU of in Shohada Hospital in Khoramabad for their help. Authors' Contribution: Ahmadreza Baghernezhad was involved in the study conception and design and data collection. Elham Sepahvand was involved in the conception and design of the study and took an active part in data analysis, interpretation of the results and writing the manuscript. Mahin Adeli contributed to data analysis and interpretation. All the authors read and approved the final manuscript. Ethical Considerations: Code of ethics: LUMS.REC.1394.29. Funding/Support: This study was financially supported by Lorestan University of Medical Sciences. 1. Simon R, Greenberg D, Aminoff M. Clinical neurology. 7th ed. Mcgraw-hill; 2009. 2. Heidarzadeh M, Ghahremanian A, Hagigat A, Yoosefi E. [Relationship between quality of life and social support in stroke patients]. Iran J Nurs. 2009;22(59):23-32. Persian. 3. Farsi news. 2012. Available from: Http://www.dadna.ir/fa/news/29203. 4. Idrovo L, Fuentes B, Medina J, Gabaldon L, Ruiz-Ares G, Abenza MJ, et al. Validation of the FOUR score (Spanish version) in acute stroke: An interobserver variability study. Eur Neurol. 2010;63(6):364-9. doi: 10.1159/000292498. [PubMed: 20551672]. 5. Sacco S, Carolei A. The FOUR score: A reliable instrument to assess the comatose stroke patient. Eur Neurol. 2010;63(6):370-1. doi: 10.1159/000313952. [PubMed: 20551673]. 6. Jung JY, Cho CB, Min BM. Bispectral index monitoring correlates with the level of consciousness in brain injured patients. Korean J Anesthesiol. 2013;64(3):246-50. doi: 10.4097/kjae.2013.64.3.246. [PubMed: 23560191]. [PubMed Central: PMC3611075]. 7. Nair SS, Surendran A, Prabhakar RB, Chisthi MM. Comparison between FOUR score and GCS in assessing patients with traumatic head injury: A tertiary centre study. Int Surg J. 2017;4(2):656. doi: 10.18203/2349-2902.isj20170209. 8. Kung WM, Tsai SH, Chiu WT, Hung KS, Wang SP, Lin JW, et al. 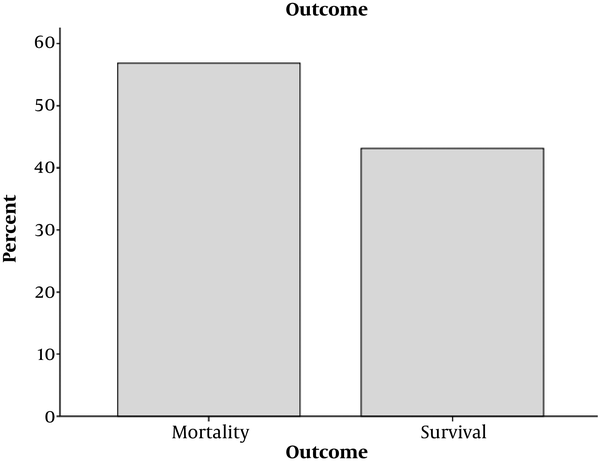 Correlation between Glasgow coma score components and survival in patients with traumatic brain injury. Injury. 2011;42(9):940-4. doi: 10.1016/j.injury.2010.09.019. [PubMed: 21067749]. 9. McNett MM, Amato S, Philippbar SA. A comparative study of Glasgow coma scale and Full Outline of Unresponsiveness Scores for predicting long-term outcome after brain injury. J Neurosci Nurs. 2016;48(4):207-14. doi: 10.1097/JNN.0000000000000225. [PubMed: 27224686]. 10. Urden LD, Stacy KM, Lough ME. Priorities in critical care nursing. 7th ed. Elsevier Health Sciences; 2015. 11. Wijdicks EF, Kramer AA, Rohs T Jr, Hanna S, Sadaka F, O'Brien J, et al. Comparison of the Full Outline of Unresponsiveness Score and the Glasgow Coma Scale in predicting mortality in critically ill patients*. Crit Care Med. 2015;43(2):439-44. doi: 10.1097/CCM.0000000000000707. [PubMed: 25393699]. 12. Fischer M, Ruegg S, Czaplinski A, Strohmeier M, Lehmann A, Tschan F, et al. Inter-rater reliability of the Full Outline of Unresponsiveness Score and the Glasgow Coma Scale in critically ill patients: A prospective observational study. Crit Care. 2010;14(2):R64. doi: 10.1186/cc8963. [PubMed: 20398274]. [PubMed Central: PMC2887186]. 13. Kasprowicz M, Burzynska M, Melcer T, Kubler A. A comparison of the Full Outline of Unresponsiveness (FOUR) Score and Glasgow Coma Score (GCS) in predictive modelling in traumatic brain injury. Br J Neurosurg. 2016;30(2):211-20. doi: 10.3109/02688697.2016.1161173. [PubMed: 27001246]. 14. Jalali R, Rezaei M. A comparison of the Glasgow coma scale score with Full Outline of Unresponsiveness Scale to predict patients' traumatic brain injury outcomes in intensive care units. Crit Care Res Pract. 2014;2014:289803. doi: 10.1155/2014/289803. [PubMed: 25013727]. [PubMed Central: PMC4071859]. 15. Idrovo Freire LA. The FOUR score: Is it just another new coma scale? Intern Emerg Med. 2012;7(3):203-4. doi: 10.1007/s11739-011-0640-5. [PubMed: 21638058]. 16. Sepahvand E, Jalali R, Mirzaei M, Ebrahimzadeh F, Ahmadi M, Amraii E. Glasgow coma scale versus Full Outline of Unresponsiveness scale for prediction of outcomes in patients with traumatic brain injury in the intensive care unit. Turk Neurosurg. 2016;26(5):720-4. doi: 10.5137/1019-5149.JTN.13536-14.0. [PubMed: 27476914]. 17. Bruno MA, Ledoux D, Lambermont B, Damas F, Schnakers C, Vanhaudenhuyse A, et al. Comparison of the Full Outline of Unresponsiveness and Glasgow Liege Scale/Glasgow Coma Scale in an intensive care unit population. Neurocrit Care. 2011;15(3):447-53. doi: 10.1007/s12028-011-9547-2. [PubMed: 21526394]. 18. Stead LG, Wijdicks EF, Bhagra A, Kashyap R, Bellolio MF, Nash DL, et al. Validation of a new coma scale, the FOUR score, in the emergency department. Neurocrit Care. 2009;10(1):50-4. doi: 10.1007/s12028-008-9145-0. [PubMed: 18807215]. 19. Kocak Y, Ozturk S, Ege F, Ekmekci H. A useful new coma scale in acute stroke patients: FOUR score. Anaesth Intensive Care. 2012;40(1):131-6. [PubMed: 22313073]. 20. Mansour OY, Megahed MM, Abd Elghany EHS. Acute ischemic stroke prognostication, comparison between Glasgow coma score, NIHS scale and Full Outline of Unresponsiveness Score in intensive care unit. Alexandria J Med. 2015;51(3):247-53. doi: 10.1016/j.ajme.2014.10.002. 21. Baratloo A, Shokravi M, Safari S, Aziz AK. Predictive value of Glasgow coma score and Full Outline of Unresponsiveness Score on the outcome of multiple trauma patients. Arch Iran Med. 2016;19(3):215-20. [PubMed: 26923895]. 22. Wijdicks EF, Bamlet WR, Maramattom BV, Manno EM, McClelland RL. Validation of a new coma scale: The FOUR score. Ann Neurol. 2005;58(4):585-93. doi: 10.1002/ana.20611. [PubMed: 16178024]. 23. Akavipat P, Sookplung P, Kaewsingha P, Maunsaiyat P. Prediction of discharge outcome with the Full Outline of Unresponsiveness (FOUR) Score in neurosurgical patients. Acta Med Okayama. 2011;65(3):205-10. doi: 10.18926/AMO/46633. [PubMed: 21709719].